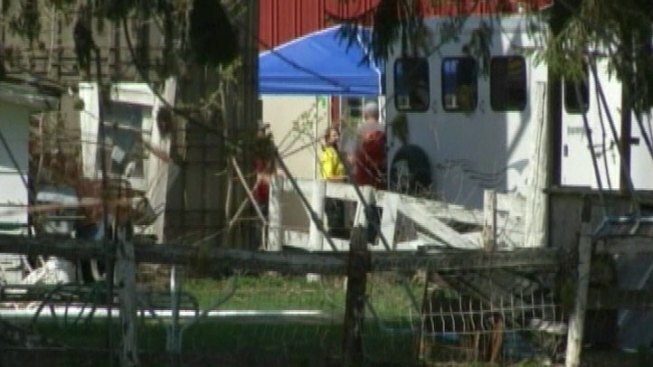 Fifty-five dead horses have been found buried on a Wisconsin farm, just weeks after the farm's owners were arrested and charged with animal abuse. Authorities first searched the Pleasant Prairie farm on April 9 after police received an anonymous tip and discovered five dead horses in barn stalls as well as partially buried horse remains. Starvation was a contributing factor in their deaths, police said. Paula and David White, the owners of the farm located on the 1800 block of 128th Avenue, were arrested and charged with animal mistreatment and neglect. Authorities returned to the farm three weeks later with the American Society for the Prevention of Cruelty to Animals and another search warrant. During a three-day search, they found the carcasses of 55 horses, 12 goats and two cows in two separate gravesites. The house on the property was deemed uninhabitable. Kenosha County police said this could be the worst case of horse abuse on record in the county. Since the discovery, numerous live horses have been removed from the farm and are being sheltered with local rescue groups. Various types of live fowl, sheep, goats and a bull also were removed. Police told the Associated Press they are urging neighbors to test their drinking water because they are concerned the carcasses were buried close enough to a stream to potentially contaminate drinking water. Police are continuing their investigation and ask anyone with information about the situation to call the Pleasant Prairie Police Department at 262-694-7353 or Kenosha Area Crime Stoppers at 262-656-7333.